Summertime and the grillin’ is easy. Fresh fish are jumpin’ and the river is high. We’re gonna get up in your grill — with flippin’ freshtastic fish. We’re talkin’ line-caught, one-fish-at-a-time, off-the-hook salmon, tuna, opah, halibut, swordfish — the best that’s runnin’, from the Columbia to the Pacific. These guys have never seen the inside of freezer (which means they’re effin fabulous). When it’s time for flip-flops or ski boots, don’t spend it in the kitchen. Our fishmongers can guide you to whatever is freshest year-round. There’s Dungeness crab, fresh, briny Pacific Northwest oysters, and more to keep you healthy, happy and satisfied, whether you’ve just come off the river or the mountain. Questions? Our employee-owners are quick to dish: top tips for grilling, best marinades, easy, grill-ready kebobs, inspired wine and beer pairings and no-holds-barred desserts. Our team has a combined experience of 140 years in food careers, and they want to share their knowledge. The last thing you want to do is ruin a good, high quality piece of fish from our case. Our staff experts are ready for any question you have. They’ll guide you with simple, straightforward tips on how to season and cook anything and have it will taste as if it was prepared in a fine restaurant. Every fish is different, and every hand-cut piece is different, so we’ll give you the guidance you need to be sure that you don’t overcook any fish (a common mishap) and take it off the heat just when a great chef would, when it’s medium rare, juicy, and slightly opaque. Sure, there are plenty of fish in the ocean — and there are lots of markets — but only one is a true Bend original, where employee-owner experts have been making every food experience fun, fresh, and totally delish, for 25 years. 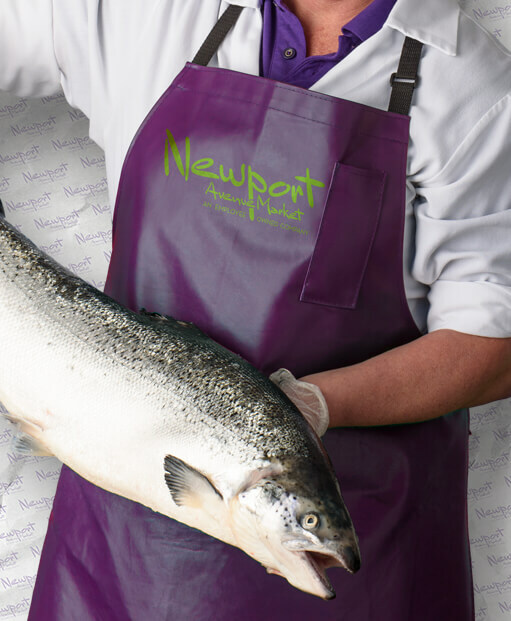 At Newport Avenue Market, not only do we bring you the best quality fish, we’re your personal seafood concierges, with the answers to anything, from cooking tips, recipes and side dishes, to wine and beer pairings. So spend more time on the river, the trails, under the sun — and then come to us when you’re ready for real food, real fun and real Bend, ’cuz we’re certified experts. (Ok, that’s bragging) but there’s plenty to back it up — it’s why, for 25 years, locals have considered our seafood to be the best, funnest and freshest. Start a new Christmas Eve tradition: cioppino!